I’ve just done a bad thing. As a photographer, I’ve got a great deal of respect for the work of others. When copyright is held by someone else, and I don’t have a licence to take it or tinker with it, I don’t. I picked up a nice brief today for a shoot in a week or two. 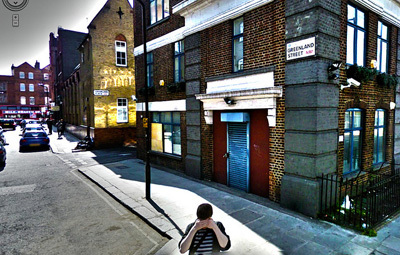 As I often do these days, I put the address into Google Street View, just to get a general sense of where the building lies, and what sort of street vistas might be possible. And there’s this guy. Right in front of the camera. Shielding his face from the camera, with not one, but both hands. I kept coming back to the image. Finding it a powerful visual metaphor for the evasion of surveillance; of a small, bowed figure at the front of the frame, seeking not to be identified. Did he know about the face-blurring they use? Did he trust it? Did he care? So I did the bad thing, and scraped the image, un-watermarked it (in a symbolic echo of de/anonymisation? ), gave it a little help with colour and tone and composed it as an image that told a story. As I like to do. You can see it in its full glory by clicking on the preview below. You can download it and use it for stuff if you so choose. P.S. Thanks to Michael Smethurst for setting the image in the context of this fabulous story from Cory Doctorow, which then made me think more about its symbolism. P.P.S. You can see the original image here (until it’s replaced by a fresh camera shot, of course). P.P.P.S. Yes, I am fully aware that I’m quite happy to use Google Street View to help me in my work but also have little frissons about some of its other “features”. But thank you for thinking it.